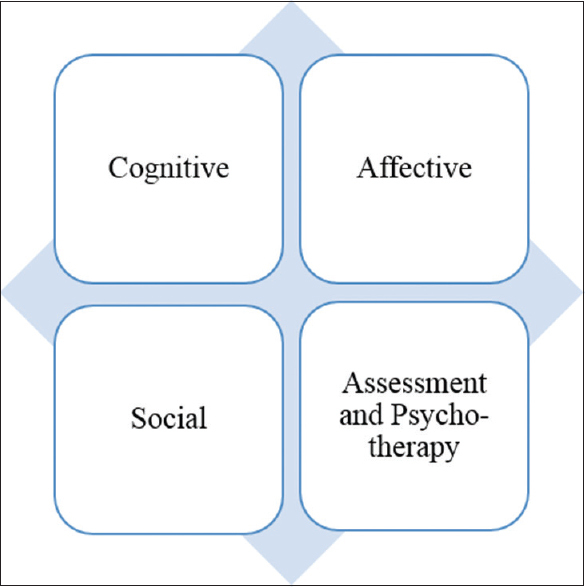 The most critical need in the field of clinical psychology is unifying the firmly grounded theoretical principles with the real-time clinical practice and modern day neuroimaging advances. The present paper purports at determining the applicability of functional near-infrared spectroscopy (fNIRS) as a tool to supplement the cognitive and affective assessment, social functioning, psychotherapy, and rehabilitation through a rigorous review of the literature. fNIRS is used to measure cortical activation by recording changes in oxygenated and deoxygenated hemoglobin. Given the advantages and wide applicability of neuroimaging techniques, fNIRS can be effectively employed to assess real-time affective, perceptual, visual, and motor and language functioning of adults as well as infants. Summarily, fNIRS is a potential measure for comprehensive assessment of both healthy and pathological cortical working. Functional near-infrared spectroscopy (fNIRS) is a technique that uses light signals to study the brain activity. This technique uses the fact that the activity of neurons is closely related to changes in blood in that region of the brain, a phenomenon known as neurovascular coupling. As the activity within the neurons increases, the blood flow to that region increases and it results in changes in hemoglobin (Hb) levels around that region. Second, the advantage of using near infrared rays is that it has the ability to be able to penetrate the skin and bone while getting absorbed by Hb within the neural tissue. Using two different wavelengths in fNIRS provides the third advantage. The wavelength of 730 nm is absorbed more by oxyhemoglobin (HbO), whereas the wavelength of 850 nm is absorbed more by deoxyhemoglobin (HbR). Thus, using fNIRS one can ascertain changes in HbO as well as HbR levels in response to neuronal activity. It is established that higher metabolic demands seen during increased brain activity leads to increased oxygen expenditure and thus, decrease in HbR levels initially. This is closely followed by increased blood flow to that region resulting in increased HbO levels. Thus, fNIRS successfully gives a fair idea regarding absorption of near infrared rays in the brain and hence, the brain activity. The present review aims at putting forward an upcoming neuroimaging technique, fNIRS, which with its promising benefaction can promote bridging the gap between psychiatry and psychology. The fNIRS device consists of a sensor band [Figure 1]a, which can be placed directly on the scalp, the region of interest (ROI). Most common fNIRS devices use a band, which can be placed on the forehead to record brain activity from the prefrontal region. The sensor band may consist of one or many source-detector combinations (one such combination is called an optode). The source in an optode is a light emitting device, which emits infrared light. This light passes through the skin and bone to reach the brain tissue and then it moves toward the detector. The path followed by the infrared light forms a “banana-shaped path” [Figure 1]b. As other tissues (except hemoglobin) do not absorb the infrared spectrum, it renders them invisible to this light. The amount of infrared light absorbed is directly proportional to the Hb amount. Hence, if we know the distance between the source and detector, we can calculate relative changes in Hb values using modified Beer–Lambert Law [Figure 1]c. As mentioned earlier using two different wavelengths we can even find relative changes in HbO and HbR levels. The main advantage of fNIRS is that recording can be done while the participant is sitting, supine or even ambulatory. The sensor band is placed so as to cover the ROI, making sure that the sensor band is in firm contact with the scalp. The standard procedure of cleaning with spirited cotton to remove dust/oil can increase sensitivity and prevent infections. However, there is no single standard protocol for positioning the band. Nevertheless, most commonly standard 10–20 international system electrode sites are noted while placing the band for inter-individual comparison. Alternatively, three-dimensional digital simulator or magnetic resonance imaging (MRI) coordinates can also be used for the same. Baseline recording is taken with the participant at rest, followed by recording during the task to find a relative increase in the brain activity. Similarly, multiple contrasts can be made by breaking the task into subtasks, to find differential brain activation using subtraction technique. Use of multiple optodes provides fairly good spatial resolution, which can be used to compare the left and right halves of the ROI. Oxygenation of ROI is calculated as the difference between concentrations of HbO and HbR, whereas total blood flow to the ROI can be calculated by adding the HbO and HbR values. The fNIRS technique can nearly be put to use in every domain of psychology as can be viewed in [Figure 2]. 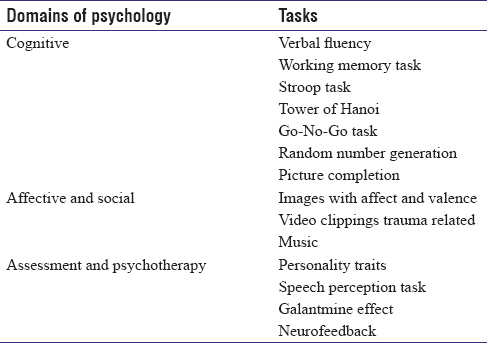 It can be used to study the areas activated during cognitive tasks as depicted in [Table 1] in healthy participants and in people with psychiatric diseases. This information would help in proving or disproving age-old theories on human cognitive psychology. fNIRS can be used to study the defects in the brain activation in cases of social phobia or antisocial behavior. Thus, psychotherapy and medications can be individualized according to the defect noted in fNIRS. Rehabilitation exercises or tasks can be used to activate the defective pathway. Recently, fNIRS has been used to demonstrate decreased oxygenation in the dorsolateral prefrontal cortex (DLPFC) and bilateral parietal area  on a verbal fluency task in patients with Alzheimer's disease as compared to healthy age-matched controls. Reduced levels of oxygenated Hb and impaired hemispheric lateralization were found out during verbal fluency task in Alzheimer's Dementia patients. Various fNIRS studies using verbal fluency task ,,, and working memory , in patients with unipolar depression found out reduced oxygenation in frontotemporal region. Decreased activity of the left prefrontal cortex during cognitive activation  (and in anxiety and affective content material) was reported in a fNIRS study in panic disorder patients. A fNIRS study related to attention and concentration deficits in verbal fluency test in patients with PTSD found out reduced activation of the prefrontal cortex. One of the studies examined contrasting alterations in the degrees of oxygenation as a reaction to “emotions” provoking impetus in both left and right prefrontal cortex. The stimuli utilized were in the form of image set appropriated by the International Affective Picture System. The study revealed heightened oxygenation during a task involving facial recognition in the left hemispheric section compared to precedent levels. Effect on emotion in terms of arousal and valence was assessed through prefrontal cortical activation while listening to music with some emotional content was assessed using fNIRS. A fNIRS study involved showing preschoolers a cartoon with emotional as well as neutral scenes to pinpoint the hemodynamic responses associated with pleasant and unpleasant emotions and anticipation. The results revealed that a rise in cerebral blood flow was observed in anticipation responses as compared to neutral stimuli. Furthermore, a decline in cerebral blood flow was noted when viewing unpleasant scenes. It was reported that when shown video clips related to trauma, increased levels of oxygenated Hb and its direct relationship with changes in heart rate were noted. fNIRS has also been used in establishing the relationship between hemodynamics of prefrontal area and tasks relating to processing of self-others. Differential activation of the prefrontal area during self-face processing and empathy in schizotypal personality was observed. Research on personality using fNIRS have demonstrated correlation between changes in hemodynamics and personality traits such as neuroticism  and agreeableness. Galantamine effects of word frequency on dementia patients were assessed using fNIRS. The results indicated that the treatment had no effect on levels of brain oxygenation although differential DLPFC activity was evident in dementia patients as compared to elderly. Word generation tasks using written or spoken language  can be used to investigate speech perception. fNIRS can also be used as a primary screening tool for Alzheimer's disease by detecting significant changes in morphology, which is evident before the onset of the disease. fNIRS has been used to evaluate the activation of sensorimotor cortex in infants during passive elbow and knee movements. A fNIRS study of newborn infants using stroboscopic light as a stimulus while sleeping reported increased oxygenated Hb in prefrontal cortices as well as in occipital lobe. In recent times, fNIRS has been applied as a neurofeedback technique during motor imagery to produce therapeutic effects. There are potential merits of fNIRS technique over other neuroimaging techniques [Figure 3]. The fact that fNIRS is noninvasive gives this technique cutting edge over other techniques, making it suitable for a wider range of populations including children. In functional MRI (fMRI), the participant has to be in supine motionless position. Such a position is not akin to real-life situation. This can be overcome by the use of fNIRS, as recording can be done in sitting, supine, or standing, and to some extent even during ambulatory state. Such an advantage allows the researchers to include tasks, which were not possible in fMRI settings. In addition, there is no enclosed chamber with magnet sounds in fNIRS technique and hence can be used in claustrophobic and child participants too. Finally, fNIRS is cheaper than as other techniques including fMRI and PET scan. The results obtained from fNIRS studies have long been compared with fMRI findings, and researchers have reported high consistency between the two tools. This offers an added advantage and the possibility of combing fNIRS with other neuroimaging techniques for a more comprehensive assessment such as with fMRI, EEG potentials, and PET scans. Furthermore, there is ever increasing technical advancement in the fNIRS system. Increasing the spatial resolution from 4 channels to 256 channel system and availability of wireless device has surely contributed to its wider scope and applicability., Relatedly, it allows representing complicated analysis in the forms of brain map images. Specifically, it is very useful method concerning psychological research aiding its ecological validity. In addition, it can be clubbed with psychological tests such as working memory task, verbal fluency task, and sustained attention tasks and so on. Finally, fNIRS makes functional real-time testing possible and simple. One underlying limitation [Figure 4] of this technique centers around its dependability on the number of channels for increased accuracy of results by investigating related brain regions. Second, the spatial resolution of fNIRS lacks the precision of that of other neuroimaging techniques. Individual participant vary in the head sizes, and hence, inter-individual comparison lacks true spatial registration. In fMRI technique, the analysis is far more advanced which allows standardizing results on same brain template for inter-individual comparison. Nevertheless, new spatial registration softwares are been developed to plot data on the same template in a fNIRS technique akin to fMRI thus increasing its precision. Though such analysis is far from the well-developed fMRI technique. In addition, currently fNIRS technique aids in examination of the major cerebral cortex as it fails to reach the depths of the brain, whereas other established techniques such as fMRI give an opportunity to the investigator for whole-brain examination. However, various new fNIRS devices are advancing toward better models to detect brain activity even in deeper parts of the brain. This review is directed at exhibiting various applications of fNIRS which on one hand help to see through the gap between clinical psychiatry and applied psychology. On the other hand, it integrates the two diverse but related fields. Thus, the widely cited literature on fNIRS makes it a suitable tool for the diagnosis and plausible one for psychotherapy as well. We would like to extend gratitude to Prof. Nandita Babu, Head of the Department, and Dr. Dinesh Chhabra, Assistant Professor, Department of Psychology, University of Delhi, for their support during the course of this review. Phillips AA, Chan FH, Zheng MM, Krassioukov AV, Ainslie PN. Neurovascular coupling in humans: Physiology, methodological advances and clinical implications. J Cereb Blood Flow Metab 2016;36:647-64. Henderson TA, Morries LD. Near-infrared photonic energy penetration: Can infrared phototherapy effectively reach the human brain? Neuropsychiatr Dis Treat 2015;11:2191-208. Bunce SC, Izzetoglu M, Izzetoglu K, Onaral B, Pourrezaei K. Functional near-infrared spectroscopy. IEEE Eng Med Biol Mag 2006;25:54-62. Wolf M, Wolf U, Toronov V, Michalos A, Paunescu LA, Choi JH, et al. Different time evolution of oxyhemoglobin and deoxyhemoglobin concentration changes in the visual and motor cortices during functional stimulation: A near-infrared spectroscopy study. Neuroimage 2002;16:704-12. Herrmann MJ, Langer JB, Jacob C, Ehlis AC, Fallgatter AJ. Reduced prefrontal oxygenation in Alzheimer disease during verbal fluency tasks. Am J Geriatr Psychiatry 2008;16:125-35. Arai H, Takano M, Miyakawa K, Ota T, Takahashi T, Asaka H, et al. Aquantitative near-infrared spectroscopy study: A decrease in cerebral hemoglobin oxygenation in Alzheimer's disease and mild cognitive impairment. Brain Cogn 2006;61:189-94. Fallgatter AJ, Roesler M, Sitzmann L, Heidrich A, Mueller TJ, Strik WK, et al. Loss of functional hemispheric asymmetry in Alzheimer's dementia assessed with near-infrared spectroscopy. Brain Res Cogn Brain Res 1997;6:67-72. Pu S, Yamada T, Yokoyama K, Matsumura H, Kobayashi H, Sasaki N, et al. Amulti-channel near-infrared spectroscopy study of prefrontal cortex activation during working memory task in major depressive disorder. Neurosci Res 2011;70:91-7. Schecklmann M, Dresler T, Beck S, Jay JT, Febres R, Haeusler J, et al. Reduced prefrontal oxygenation during object and spatial visual working memory in unpolar and bipolar depression. Psychiatry Res 2011;194:378-84. Folley BS, Park S. Verbal creativity and schizotypal personality in relation to prefrontal hemispheric laterality: A behavioral and near-infrared optical imaging study. Schizophr Res 2005;80:271-82. Hori H, Nagamine M, Soshi T, Okabe S, Kim Y, Kunugi H, et al. Schizotypal traits in healthy women predict prefrontal activation patterns during a verbal fluency task: A near-infrared spectroscopy study. Neuropsychobiology 2008;57:61-9. Fallgatter AJ, Strik WK. Reduced frontal functional asymmetry in schizophrenia during a cued continuous performance test assessed with near-infrared spectroscopy. Schizophr Bull 2000;26:913-9. Kubota Y, Toichi M, Shimizu M, Mason RA, Coconcea CM, Findling RL, et al. Prefrontal activation during verbal fluency tests in schizophrenia – A near-infrared spectroscopy (NIRS) study. Schizophr Res 2005;77:65-73. Quaresima V, Giosuè P, Roncone R, Casacchia M, Ferrari M. Prefrontal cortex dysfunction during cognitive tests evidenced by functional near-infrared spectroscopy. Psychiatry Res 2009;171:252-7. Shinba T, Nagano M, Kariya N, Ogawa K, Shinozaki T, Shimosato S, et al. Near-infrared spectroscopy analysis of frontal lobe dysfunction in schizophrenia. Biol Psychiatry 2004;55:154-64. Nishimura Y, Tanii H, Fukuda M, Kajiki N, Inoue K, Kaiya H, et al. Frontal dysfunction during a cognitive task in drug-naive patients with panic disorder as investigated by multi-channel near-infrared spectroscopy imaging. Neurosci Res 2007;59:107-12. Akiyoshi J, Hieda K, Aoki Y, Nagayama H. Frontal brain hypoactivity as a biological substrate of anxiety in patients with panic disorders. Neuropsychobiology 2003;47:165-70. Matsuo K, Taneichi K, Matsumoto A, Ohtani T, Yamasue H, Sakano Y, et al. Hypoactivation of the prefrontal cortex during verbal fluency test in PTSD: A near-infrared spectroscopy study. Psychiatry Res 2003;124:1-10. Power SD, Kushki A, Chau T. Intersession consistency of single-trial classification of the prefrontal response to mental arithmetic and the no-control state by NIRS. PLoS One 2012;7:e37791. Tanida M, Sakatani K, Takano R, Tagai K. Relation between asymmetry of prefrontal cortex activities and the autonomic nervous system during a mental arithmetic task: Near infrared spectroscopy study. Neurosci Lett 2004;369:69-74. Hoshi Y, Tamura M. Near-infrared optical detection of sequential brain activation in the prefrontal cortex during mental tasks. Neuroimage 1997;5:292-7. Hock C, Müller-Spahn F, Schuh-Hofer S, Hofmann M, Dirnagl U, Villringer A, et al. Age dependency of changes in cerebral hemoglobin oxygenation during brain activation: A near-infrared spectroscopy study. J Cereb Blood Flow Metab 1995;15:1103-8. Villringer A, Planck J, Hock C, Schleinkofer L, Dirnagl U. Near infrared spectroscopy (NIRS): A new tool to study hemodynamic changes during activation of brain function in human adults. Neurosci Lett 1993;154:101-4. Herrmann MJ, Ehlis AC, Fallgatter AJ. Prefrontal activation through task requirements of emotional induction measured with NIRS. Biol Psychol 2003;64:255-63. Automatic Detection of a Prefrontal Cortical Response to Emotionally Rated Music Using Multi-Channel Near-infrared Spectroscopy – IOPscience. Available from: http://www.iopscience.iop.org/article/10.1088/1741-2560/9/2/026022/meta. [Last accessed on 2017 Aug 27]. Sato H, Aoki R, Katura T, Matsuda R, Koizumi H. Correlation of within-individual fluctuation of depressed mood with prefrontal cortex activity during verbal working memory task: Optical topography study. J Biomed Opt 2011;16:126007. Ruocco AC, Medaglia JD, Ayaz H, Chute DL. Abnormal prefrontal cortical response during affective processing in borderline personality disorder. Psychiatry Res 2010;182:117-22. Ruocco AC, Medaglia JD, Tinker JR, Ayaz H, Forman EM, Newman CF, et al. Medial prefrontal cortex hyperactivation during social exclusion in borderline personality disorder. Psychiatry Res 2010;181:233-6. Pu S, Matsumura H, Yamada T, Ikezawa S, Mitani H, Adachi A, et al. Reduced frontopolar activation during verbal fluency task associated with poor social functioning in late-onset major depression: Multi-channel near-infrared spectroscopy study. Psychiatry Clin Neurosci 2008;62:728-37. Pu S, Nakagome K, Yamada T, Yokoyama K, Matsumura H, Mitani H, et al. The relationship between the prefrontal activation during a verbal fluency task and stress-coping style in major depressive disorder: A near-infrared spectroscopy study. J Psychiatr Res 2012;46:1427-34. Hoshi Y, Chen SJ. Regional cerebral blood flow changes associated with emotions in children. Pediatr Neurol 2002;27:275-81. Matsuo K, Kato T, Taneichi K, Matsumoto A, Ohtani T, Hamamoto T, et al. Activation of the prefrontal cortex to trauma-related stimuli measured by near-infrared spectroscopy in posttraumatic stress disorder due to terrorism. Psychophysiology 2003;40:492-500. Platek SM, Fonteyn LC, Izzetoglu M, Myers TE, Ayaz H, Li C, et al. Functional near infrared spectroscopy reveals differences in self-other processing as a function of schizotypal personality traits. Schizophr Res 2005;73:125-7. Ito M, Fukuda M, Suto T, Uehara T, Mikuni M. Increased and decreased cortical reactivities in novelty seeking and persistence: A multichannel near-infrared spectroscopy study in healthy subjects. Neuropsychobiology 2005;52:45-54. Richter MM, Herrmann MJ, Ehlis AC, Plichta MM, Fallgatter AJ. Brain activation in elderly people with and without dementia: Influences of gender and medication. World J Biol Psychiatry 2007;8:23-9. Watson NF, Dodrill C, Farrell D, Holmes MD, Miller JW. Determination of language dominance with near-infrared spectroscopy: Comparison with the intracarotid amobarbital procedure. Seizure 2004;13:399-402. Kusaka T, Isobe K, Miki T, Ueno M, Koyano K, Nakamura S, et al. Functional lateralization of sensorimotor cortex in infants measured using multichannel near-infrared spectroscopy. Pediatr Res 2011;69:430-5. Taga G, Asakawa K, Hirasawa K, Konishi Y. Hemodynamic responses to visual stimulation in occipital and frontal cortex of newborn infants: A near-infrared optical topography study. Early Hum Dev 2003;75 Suppl:S203-10. Mihara M, Miyai I, Hattori N, Hatakenaka M, Yagura H, Kawano T, et al. Neurofeedback using real-time near-infrared spectroscopy enhances motor imagery related cortical activation. PLoS One 2012;7:e32234. Rostrup E, Law I, Pott F, Ide K, Knudsen GM. Cerebral hemodynamics measured with simultaneous PET and near-infrared spectroscopy in humans. Brain Res 2002;954:183-93. Ehlis AC, Ringel TM, Plichta MM, Richter MM, Herrmann MJ, Fallgatter AJ, et al. Cortical correlates of auditory sensory gating: A simultaneous near-infrared spectroscopy event-related potential study. Neuroscience 2009;159:1032-43. Hock C, Villringer K, Müller-Spahn F, Wenzel R, Heekeren H, Schuh-Hofer S, et al. Decrease in parietal cerebral hemoglobin oxygenation during performance of a verbal fluency task in patients with Alzheimer's disease monitored by means of near-infrared spectroscopy (NIRS) – Correlation with simultaneous rCBF-PET measurements. Brain Res 1997;755:293-303.